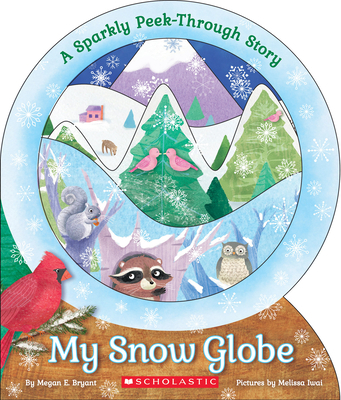 A charming new snow globe-inspired board book just in time for the holidays! This shaped board book looks just like a snow globe with a clear acetate window and shimmery glitter on every die-cut layered page. Kids won't be able to resist turning the pages, reading the lyrical story by Megan E. Bryant, and watching the colorful illustrations by Melissa Iwai come to life. With adorable forest animals hidden on every spread, here's a glorious gift book to treasure all throughout the snowy season. Megan E. Bryant got her start as a children's book editor. She now pursues a career in writing, and has produced more than 100 storybooks, chapter books, easy readers, and board books. She lives in Winston-Salem, North Carolina, with her husband, a university professor, and her daughter. Melissa Iwai received her BFA in Illustration from Art Center College of Design in Pasadena, CA. Now she's an illustrator of many board books and picture books for children, including Truck Stop, Hush Little Monster, and Green as a Bean. She lives in Brooklyn with her family.